Oh, I am a sucker for this photograph. The love, the elation, the sheer delight on Cate and Seb’s faces. The formality of a cathedral, the informality of flip-flops and sunglasses. I love Cate’s explanation for why they were in front of Exeter Cathedral in the first place, and how this photograph proves that the best marrieds are very often the best of friends. It’s Friday…if you need another reason to smile…this is it. “This photo was taken without any planning, and I completely love it. Seb and I got married at 11 in the morning and by this point we were really giddy on love, happiness and champagne! We were back in Exeter, standing on the Cathedral green and pretending we had got married in the Cathedral. A friend of ours captured the moment when Seb wrapped my dress around him, and I love it because it captures the very essence of our relationship together, which is fun and happiness. Seb had just had to replace his button hole because we had spent the whole day hugging family and friends, and his real one had been completely crushed. I love the fact you can just glimpse our flip-flops and Seb has his sunglasses on his head. It captures how relaxed the whole day was, and sums up how we never take ourselves too seriously. Gorgeous! I'm a fan of the groom getting involved with the bride's outfit. And we had an early wedding too… fabulous for making a brilliant day just a teeny bit longer, and inadvertently a true test of booze tolerance and stamina! I love this! It's great to see the happiness radiating off Cate and Seb. The only complaint I've ever had about avidly reading AOW is the constant sensation of being out-cooled by lots of the photos that grace these pages. This photo is a case in point, as is pretty much every photo of Aisling. I love the flip-flops and the sunnies – fingers crossed for a sunny Friday! 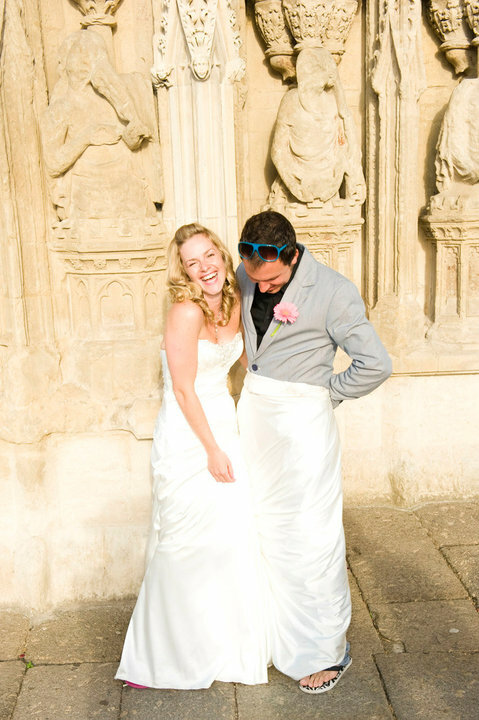 Your laugh reminds me of how I was on my wedding day – me and hubby are always joking around and our wedding day was no exception – I kept collapsing into giggles like you are doing in this pic! What a photo for you to cherish – lovely! Gorgeous pic! That's what it's all about. Sunny, bright and smiley – how lovely! Now I am grumpy that Bean didn't play with my dress! Aw this made me smile, gorgeous! I love this SO much, I get an achey face when I look at it for too long from all the smiling! You two are so unbelievably cute, I can't take it! Is from Exeter and we would always joke that we'd get married there. Sigh. And Gemma, good lord lady. I think I might love you. Abi – too right big up the westcountry brides!! Thanks everyone else for your lovely words. They make me smile on this rainy Saturday!